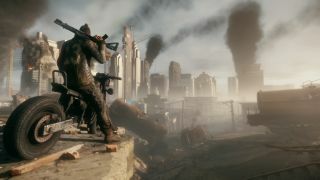 It's Homefront: The Revolution's civilian population that interests me most. There's potential to get inside the minds of an oppressed people and explore the dynamics between an armed resistance, collaborators and those just trying to get on with their lives. Whether The Revolution can exploit that potential remains to be seen, but NPCs promise to be more than decoration. The new 'Ignite' trailer alludes to the Hearts and Minds mechanic—you need to inspire uprising throughout oppressed Yellow Zones before the Korean People's Army can be forced out. In the process, zones will transition from martial law to open rebellion. Blowing up KPA infrastructure seems a less than subtle way to win the admiration of the people, but hey, it would work on me.